You can see details such as the expiration date or the host names the certificate is valid for. You can also see the certificate chain. 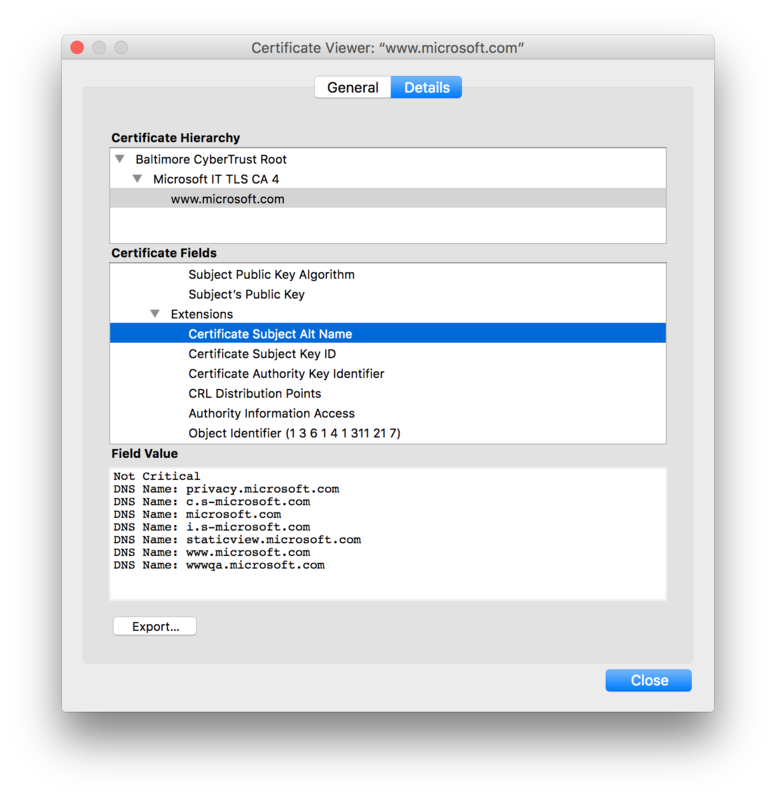 This certificate was issued by the certificate authority “Microsoft IT TLS CA 4”. And its certificate was issued by “Baltimore CyberTrust Root”. Baltimore CyberTrust Root is in the list of trusted root certificates of most operating systems and that is why I can connect to https://www.microsoft.com/ without getting an error message. This root certificate list is unfortunately the weakest link in the entire HTTPS story. Most users don’t check which root certificates are installed on their machine. There have been cases where computer vendors added their own certificate to the root certificates list. 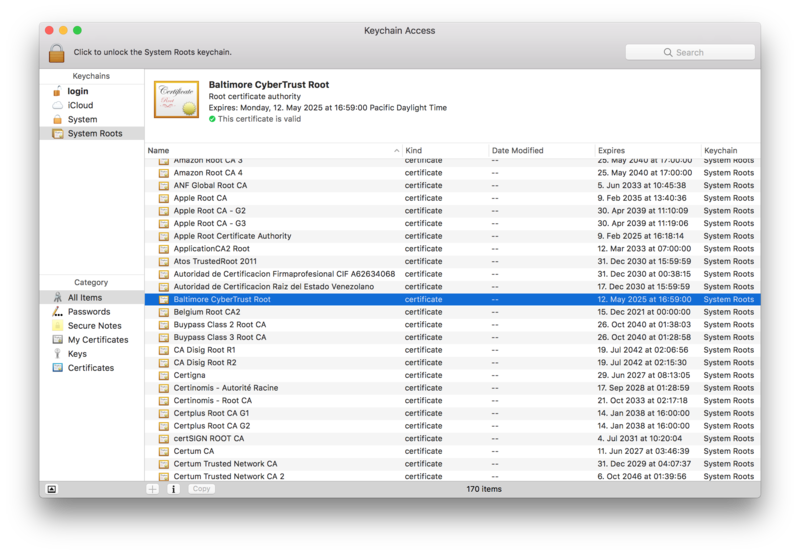 And there are also numerous companies that install the company’s root certificate onto each employee’s device so they can monitor all traffic by doing a man-in-the-middle attack. For the browser story, this is currently the only way to make sure your browser can connect to all HTTPS servers on the internet, even those it has never contacted. But for a connection from a mobile app to its backend, you usually know exactly which server you’re connecting to. From a security perspective, it is a good idea to take advantage of this. This code replaces the default certificate validation with custom code. This code compares the public key of the server’s certificate with the expected pubic key of the server. This public key corresponds with the private key that is installed on the server. Since it is not possible to derive the private key from a public key, this means that we can guarantee we’re talking to that one server and not any server our operating system happens to trust. It only works for this one server. If you have multiple servers you’re connecting to with different public keys, you’ll have to differentiate her. This code does not account for changes to the server certificate. In the case of connecting to a server you don’t control yourself, the certificate could be changed at any point which we require an update of the app for it to work again. You could check other criteria, e.g., the certificate’s expiration date. An alternative you can think about is rolling your own certificate authority and pinning not the certificate itself but the certificate authority. Even though a browser would not trust such a certificate from an unknown certificate authority, a mobile app would work just fine. What is commonly referred to as SSL (Secure Sockets Layer) was actually renamed to TLS (Transport Layer Security) in 1999. TLS 1.2 is the current version and TLS 1.3 is expected to be finalized soon. All older version, including SSL 2, SSL3, TLS 1.0, and TLS 1.1 should not be considered sufficiently secure anymore at this point. At this time, TLS 1.2 should be used for all communication. If you’re using Azure Websites as your backend, here’s an article on how to disable older TLS versions. Xamarin developers will have to be aware that there are different implementations of HttpClient available and not all support TLS 1.2 or other security features. For help on picking the right HttpClient, I wrote a blog post entitled The many flavors of HttpClient. Pinning both the certificate and the TLS version will make it much harder to intercept the communication between your app and its backend. It should be employed whenever making calls to a backend within the control of the app developer. 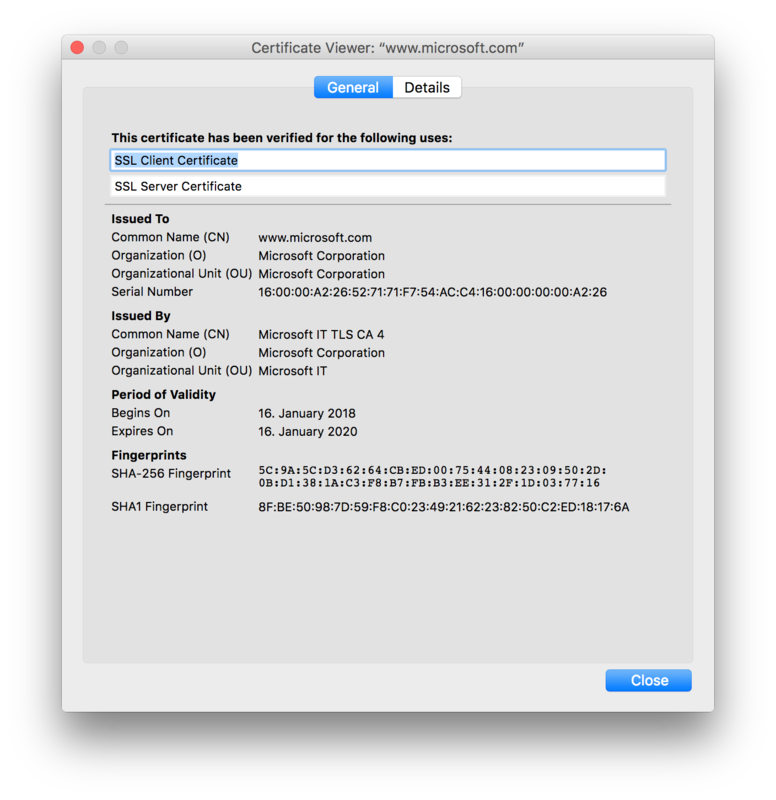 How do you handle generating a new certificate when your old one expires? Can you somehow keep the same public key when doing this? No, a new certificate always means a new public key. You will have to work out a way of doing in the app and plan ahead, either by supporting both the current public key and the future one or by pinning the certificate authority and not the certificate itself. If you’re only using the backend from your app and not from a browser you could also just leave the expired certificate on the server and just not check for expiration on the client side. This would still be more secure than relying on the root certificate authority list.